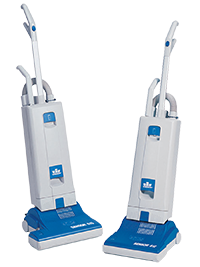 The Advance VacRide is the first rider-vacuum with true vacuum performance. 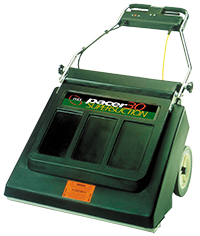 The VacRide's dual motors and dual HEPA filters provide better dirt pickup and filtration than carpet sweepers and other rider vacuums. You'll save time while cleaning large carpeted areas, compared to traditional wide area vacuums. A 28" vacuum deck plus standard side broom gives you a 34" cleaning path, while a standard detailing wand offers the ability to clean base boards without getting off of the machine. See specifications table for details. Click here to view more vacuums. 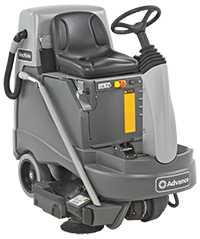 Advance’s 12" and 15" Spectrum single motor upright vacuums deliver superior results with performance where it matters most: dirt pickup and filtration. Spectrum’s innovative design has earned the CRI Seal of Approval – signifying that Spectrum meets the industry’s newest dirt pickup and filtration standards for vacuum performance. These standards are more stringent than those for Green Label certification. And at a budget-conscious price, it offers better performance at a fraction of the cost to clean. Spectrum’s filtration performance is due to the vacuum’s three stage filtration system, which includes a certified HEPA filter. See specifications table for details. Two 1-HP vacuum motors and 0.33-HP brush motor, 30" path, beaterbrush upright vac with brush-assisted propulsion, 1.5 bushel cloth filter bag and a convenient adjustable handle that folds down for storage. (Version with detail wand and attachments, and/or HEPA filter available special order.) See specifications table for details.